MADISON – After a six-hour ride over increasingly treacherous roads, it took a full day's hike up almost 3,000 feet for Leonora Bittleston to reach Nepenthes Camp in the Maliau Basin, an elevated conservation area in Malaysian Borneo with a rich, isolated rainforest ecosystem. In new research published Aug. 28 in the journal eLife, Bittleston, University of Wisconsin-Madison botany and bacteriology professor Anne Pringle, and others, reveal that the communities created inside pitcher plants converge just as the shape and function of the plants themselves do. Despite being separated by continents and oceans, pitchers tend to house living communities more similar to one another than they are to their surrounding environments. 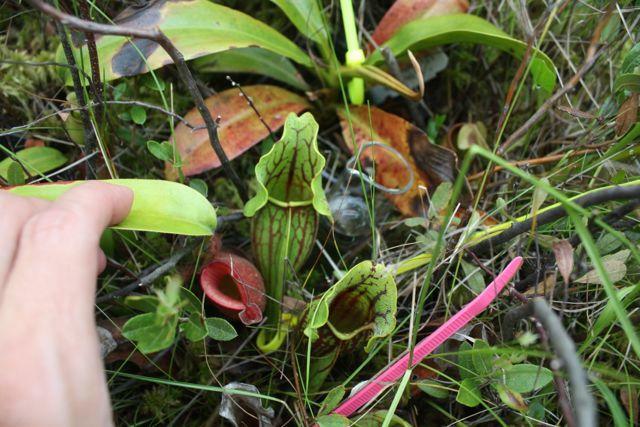 Asian pitchers transplanted to Massachusetts bogs can even mimic the natives so well that the pitcher plant mosquito — a specialized insect that evolved to complete its life cycle exclusively in North American pitchers — lays eggs in the impostors. But despite that gruesome image, pitcher plants serve as more than just death traps — they are also ecosystems unto their own. Each liquid-filled pitcher houses diverse microbial life and even living complex organisms and insects that escape digestion. It's those communities that attracted the attention of Pringle and Bittleston. This research was supported by a National Science Foundation Graduate Fellowship and Doctoral Dissertation Improvement Grant (DEB-1400982), a Putnam Expedition Grant from the Harvard University Museum of Comparative Zoology, a grant from the Templeton Foundation, National Geographic and National Science Foundation (grant SES-0750480), and the High Impact Research Grant (UM-MOHE HIR Grant UM.C/625/1/HIR/MOHE/CHAN/14/1, no. H-50001-A000027 and A-000001-50001).